Certain denominations of faith like Catholic, Baptist and protestant are very common today. However, there are other unpopular faiths that helped pave way to religious freedom by leaving their countries in search of that freedom. Two religious groups of faith that greatly played a role in the fight for religious freedom are the Puritans and the Quakers. These two religious groups faced prosecution in England and sought religious freedom in the American colonies. They disliked the rituals and hierarchical practices of the England churches. They emphasized on simplicity in lifestyle as well as worship. However, these two had significant differences in their beliefs. In the year 1630, the Puritans settled in Massacheusetts Bay in Boston, with the objective of achieving religious freedom. This was after the arrival of the pilgrims in America, who had the same goal in mind. Puritans chose this name because their main objective was to have a pure religion. Just like the pilgrims, they did not see eye to eye with the Church of England but they did not detach themselves from the main church. In 1630, the puritans got a leader by the name John Winthrop. 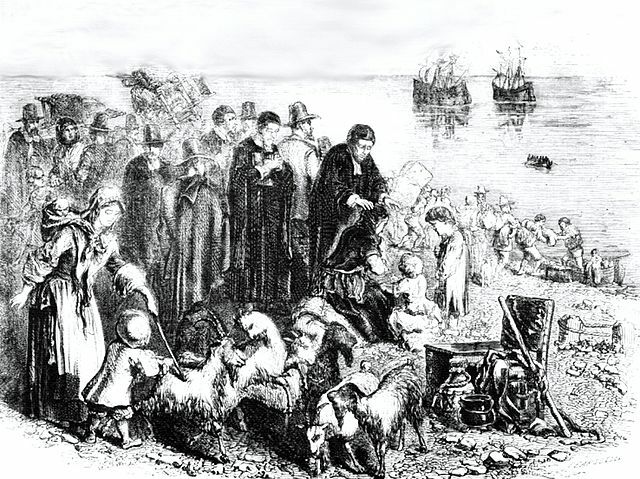 John brought over 1,000 other Puritans to the colony Massachusetts Bay and they traveled in more than 15 ships. Winthrop was the leader of that colony until 1650. Puritans believed that everyone should have the ability to study the Bible. It was compulsory for all parents to teach all their children how to read. For every town with 50 families or more, a school was built. These schools remained open all year long and there was not even a summer vacation. Due to their emphasis on education, the Puritans built the first institution in the England. They are the people that built the elite University of Harvard in the year 1963. In the year 1681, William Penn was granted permission to start a colony by the English king. He was a member of the Quakers which was a well-known religious group that was being mistreated in England due to their beliefs. They believed that everyone is equal and every person is good. They did not encourage any form of violence and they even refused to carry weapons or even engage in fights with anyone. They believed that every problem can and should be solved peacefully. They were known as “The friends” due to their love for peace. When in Pennsylvania, Quakers practiced religious freedom for everyone. People were free to believe what they wanted and talk to God in their own way. People from all over Europe poured into their communities in search for religious freedom. They believed that religion is not the words from one’s mouth but it is their action. To a Quaker, to be religious, your actions had to show it. They treated people with honesty, they helped the poor, they worked for and upheld women rights and also they fought for the rights of the Native Americans. They didn’t fight physically but they protested, boycotted and politely pointed out their grievances. Puritans viewed humanity as being hopelessly sinful while Quakers believed that God lives inside everybody. Puritans believed that most people were destined for eternal damnation while some were chosen by God for salvation. The chosen few went through a process of conversion by testifying and exercising holy behavior. 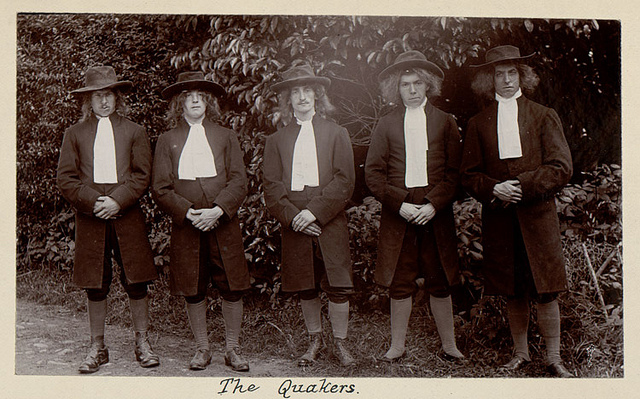 Quakers believed in “inner light” that enabled a person to view humanity in the most positive way. Puritans had a strong belief in baptism and Holy Communion while Quakers did not put emphasis to any sacrament because they believed that all acts are sacred if they are committed to God. Puritans had long services in which a minister would explain sections of the Bible and pointing out sins of those present. Puritans had a rigid system where only men were allowed to vote for church leaders and anyone wanted to leave the Puritan community had to be granted permission by the local church or risk losing all their property. On the other hand, Quakers had more religious freedom. It was one of the pioneer religious groups that allowed women to participate as well as hold leadership seats in church. Puritans used the Bible and their religious beliefs to establish the rules of law while Quakers used the Bible as a book of reference and guidance. Puritans held traditional beliefs about the roles that males play and the roles that females play. No female was allowed to be a minister. Only the men were allowed to occupy the seats of church leaders. However, Quakers believed in equality. Puritans discriminated Native Americans while Quakers supported the Native Americans by building for them numerous schools and allowing them to have leadership positions. Puritans and Quakers helped pave way to religious freedom by coming to America in search of that freedom. Both religions believed in God and they both had the hope to create a society that would purify the Christian religion. Evah Kungu. 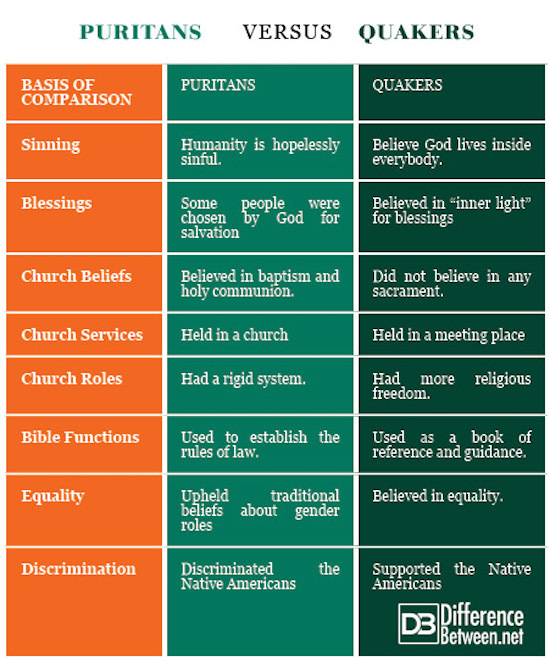 "Difference Between Puritans and Quakers." DifferenceBetween.net. July 17, 2018 < http://www.differencebetween.net/miscellaneous/religion-miscellaneous/difference-between-puritans-and-quakers/ >. PBS: People and Ideas: The Puritans Washington State University. “Puritanism in New England” 4(5) 57-98. Library of Congress: “America and the Founding of the American Religions” 8(7) 345-502. Encyclopedia of the Geneology of Quaker Religion, 8(2) 1740-1945. David, Hall. “A Puritanism and the Reforming Transformation of Public Life People in New England” 1(1) 543-654.